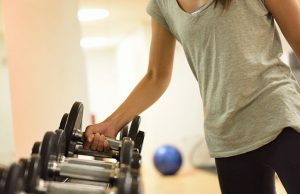 In the interest of maximizing the time spent working toward beautiful non-flabby upper arms, there are good exercises and then there are excellent exercises! One of the most effective triceps exercises, as we covered last time, are triangle push-ups done basically the same as regular push-ups except with hands placed directly below the chest forming a triangle rather than at shoulder width as in regular push-ups. Kickbacks are another excellent and effective triceps workout; in fact according to research by the American Council on Exercise, a certification agency for pro fitness trainers, kickbacks are a close second to triangle push-ups. Standing beside a step or exercise platform, place your left foot on the step and rest your left forearm on your knee/thigh to support your back while bending forward. With a weight in your right hand, pull the weight up until your right elbow is at torso level. Now lower your forearm to a resting position (still keeping your upper arm against your torso). Repeat this motion slowly while keeping your upper arm steady against your body and complete a set of 8 repetitions. Depending on how you feel, repeat as many sets as you can comfortable do without causing pain, then change position to work the other arm. The hand-weight you use should allow you to comfortably do repetitions without losing good form as you might if the weight is too heavy. The key to making the most of this triceps toning exercise is to stay focused on contracting the muscles as you â€˜kickbackâ€™ your arm, then lower slowly and maintain a steady upper arm through all reps. Working the triceps by doing dips is also recommended by the American Council on Exercise as one of the top three, right up there with triangle push-ups and kickbacks. Stand in front of a sturdy chair (back to the chair) and hold the front of the seat with hands just slightly less than shoulder width apart and knuckles facing down. Bend at the knees so your legs form a 90-degree angle. Lower your body while bending your elbow but keep elbows from pointing outward as you lower yourself. Next, straighten your arms to lift your body up and repeat this motion for 8 repetitions. Work to the point of muscle fatigue but stop if you feel pain. Rest a minute or so between sets; do as many sets as you feel good about, then rest this muscle group for at least 24 hours. Try to do triceps dips 2 to 3 times per week. The baby boomers are getting more greys but that doesnâ€™t mean theyâ€™re slowing down, at least not about health and well-being. The demand for fitness instructors and personal trainers in seniorsâ€™ communities continues to grow as our population ages and existing facilities are being improved to accommodate that demand. Popular activities in retirement communities are dance classes, yoga and self-defense training plus strength training with a personal trainer. Whether youâ€™ve been toning for years or are just starting, stay persistent, ask your trainer to make sure youâ€™re getting the maximum benefit from your workouts and start imagining how great youâ€™ll look in a sleeveless dress at dance class!